For more event photos please go to our FACEBOOK page. Cry In Your Beer Bawl: We shattered all previous fundraising efforts with our 6th annual event. 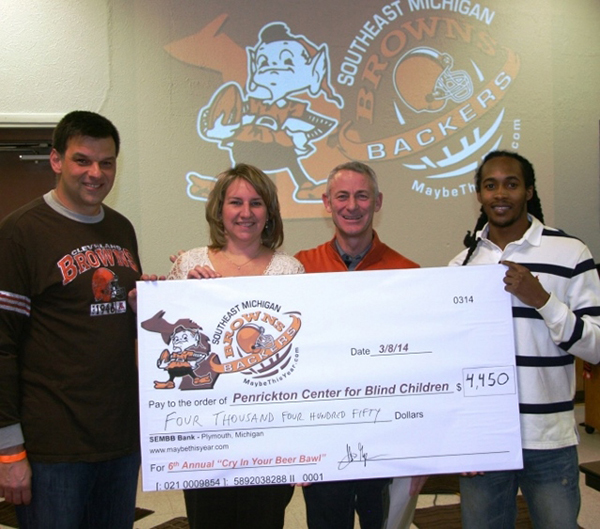 Brian Brennan and Travis Benjamin helped us raise $4,450 for the Penrickton Center for Blind Children. ALEXANDER'S EXPRESS: Through our "Super Bowl Squares" program, we raised $1000 for this great cause. 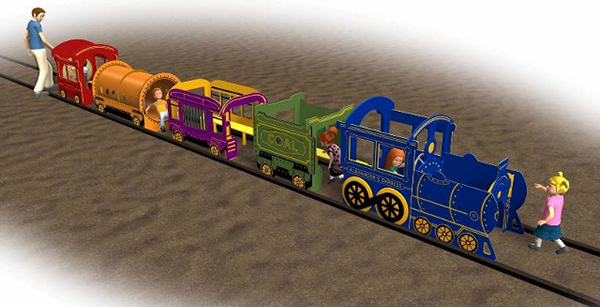 This will be a train-style play structure in Plymouth Township Park built in memory of a local toddler that died tragically last year. 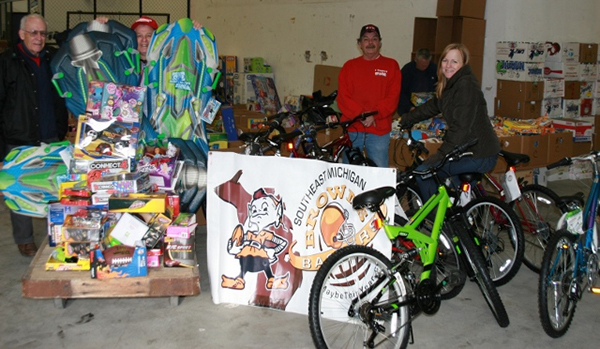 Toys for Tots: We raised funds all through the season with our "Game Day Raffles" and donated $1500 to the Toys for Tots program in Metro Detroit. We were able to make Christmas morning special for many families by donating brand new bicycles. Cry In Your Beer Bawl: With the help of Frank Minnifield, John Hughes and a record crowd of over 100 Browns Backers, we broke our record for a single event. We raised over $2500 for the Penrickton Center for Blind Children! Toys for Tots: We used proceeds from our gameday raffles all season long to raise $1000for the 3rd Battalion, 25th Marines Toys for Tots drive. Thank you to all that bought raffle tickets and supported this great cause! Carolyn enjoyed buying the toys, and Stan and Jacob enjoyed dropping them off in Brookpark, OH. Cry In Your Beer Bawl: Our event at Red Olive Banquet Center featured Browns alumni Eric Metcalf. We raised $1200 for the Penrickton Center for Blind Children. 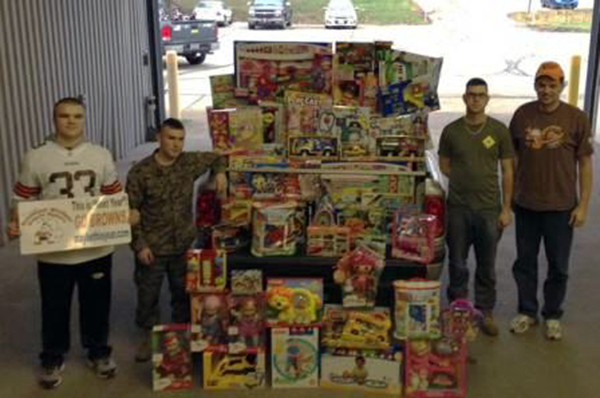 Toys for Tots: Through our gameday raffles, we raised over $500 for the 3rd Battalion 25th Marines Toys for Tots drive. Cry In Your Beer Bawl: Our March banquet featured Browns alumni Reggie Langhorne, Ross Fichtner and current Browns' safety TJ Ward. This year's event helped raise over $1000 for Noah's Arc, an autism support charity. Cry In Your Beer Bawl: Our March banquet with Leroy Kelly helped raise over $850 for First Step, a domestic violence shelter located in Plymouth. Motor City Weekend: Raffles at Motor City Weekend III and the first few Browns games generated $235 to "Help Jimmy." Jimmy got to see his first Browns game with his family thanks to our club. Jimmy is a 15 year old boy with MS.
Holiday Fundraiser: We raised $105 cash and several toys for the USMC Toys for Tots program. Our founder and President Emeritus once served proudly for the 3/25 Marines based in Brookpark, OH. That unit is currently in Afghanistan. Semper Fi 3/25!! Texas Hold 'Em Tournament: Our second annual tournament saw a smaller, but dedicated crowd attend. Congratulations to all who participated and helped us raise $250 for the Penrickton Center for Blind Children. Minnifield Auction: Proceeds from the Auction held during the Frank Minnifield BBQ (during the Motor City Weekend) raised $1000 for the Penrickton Center for Blind Children. The donation check was presented during the Bills game attended by Greg Pruitt. Texas Hold 'Em Tournament: 13 players participated in our first poker tournament. Congratulations to George Grayshaw! He won our tournament and helped us raise $325 for the Penrickton Center for Blind Children. 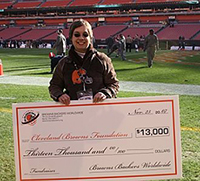 Cleveland Browns Foundation Fundraiser: Thank you to all that participated in last year's fundraiser. We raised $2,270 for the Foundation through raffles, auctions and individual donations. Dinner with Hanford Dixon: Our dinner with the Top Dawg on November 2nd was a huge success. We raised over $1,100 for the Right Path Foundation and had lots of fun doing it.